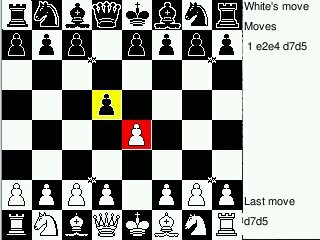 Sweet, gnu chess is a good chess engine. This games graphics remind me of a tandy game i played on an emulator a few days ago in linux. First, thanks for this port! There is a bug in v0.1 with taking out pieces en passant: although it works correctly the piece optically doesn�t disappear from the board. MMmmm....Yes ok apart from the en-pass,and Oh when playing BLACK I like the pieces at the BOTTOM of the board so can't really play as black.Enyway I'LL give you 6/10 on this one,keep at though better next time A? Well what can I say; �this has to be the definitive chess program for the GP2X� My thanks to you for a truly great effort 10/10. Tis a great chess game. Doesn't anyone think that maybe there should be a "background" MP3 player on the GP2X which allows your music to continue playing whilst you're playing a game? I've been looking for a Chess program for the GP and have found this: it's perfect! Great work! Has this got multiplayer and tv-out ? If not it should be added !! Good port, Parky. I have only one thing to suggest, and that is that the cursor will continue moving if you hold down a directional a bit. Movement is a little tedious.